I was looking for a picture for a project I am working on and happened upon these two pictures. I had to post them because it really made me realize how quickly time flies. I am truly grateful for both of my adorable children. I love you both! 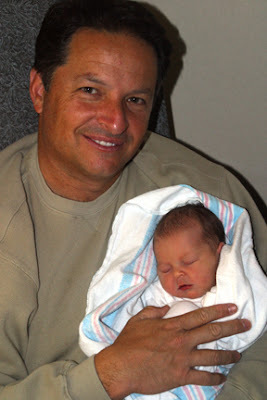 This is my awesome dad holding Sadie when she was just born. My family all came to the hospital right as Sadie was being born. It was so fun to have them right outside the room waiting to share in the great joy of Sadie. Sadie and "Bumpa" (his 1st grandchild) still have a special bond! 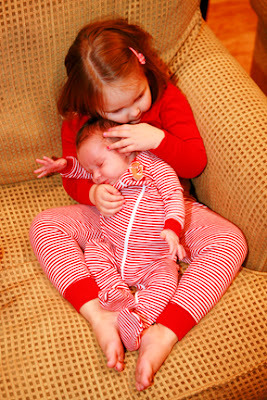 This is Sadie holding Sam on Christmas Eve 2005. Sam was just a couple of weeks old and Sadie was already the playing the protector role. She loved to cuddle with him, and she was extremely gentle. It is always fun to look back on fond memories. Hello. I'm commenting on your blog. I'm also hoping you will post again soon because I miss you guys.